This road map identifies six opportunities for patient engagement supported by recommendations for action. They are focused on harnessing the passion of the diabetes community to expand access to improve the lives of all people living with diabetes. Access encompasses information, resources, support, technology, research, clinical trials, policymakers and regulators. These opportunities and recommendations are the result of several months of outreach, research and analysis. 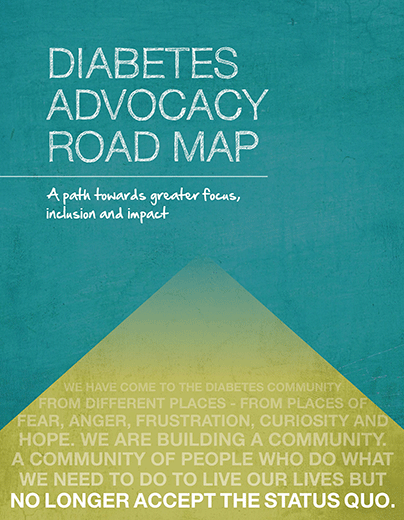 This work culminated in the most comprehensive review of the diabetes stakeholder community to date. While each recommendation could stand alone, when connected they form an overarching strategy with each part contributing to the strength of the whole. Across several of the recommendations there are tactics to build a well-characterized database for engagement at all levels of the advocacy pyramid. In addition, there are recommendations that call for building non-traditional partnerships. These partnerships will be more effective if they are broader than any one recommendation and create a long-term mechanism for engagement.